Zvi suggested contacting the NAPFA, the National Association of Personal Financial Advisors, for someone in your area. 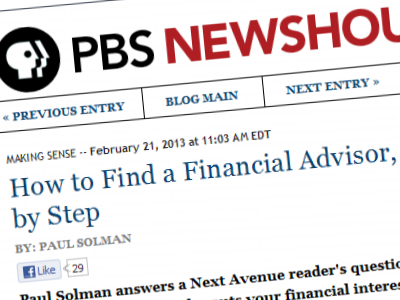 He also recommended his own online library of resources for getting started with a financial advisor. Zvi Bodie: You’re looking for an enduring relationship based on mutual respect and trust, so plan on investing at least as much effort as you’d put into choosing an automobile, especially a used one. You should make sure you choose an advisor who puts your interests first, and avoid advisors whose services are “free.” Free advice is usually worth less than you pay for it. Advice offered “for free” often comes from brokers and salespeople whose products have commissions embedded in them. Many brokers and insurance agents call themselves financial advisors, so names don’t necessarily tell you all you need to know. It’s in the broker’s interest to make the sale, whether the product is best for you or not. Even upright, highly ethical brokers are subject to this conflict, which can operate at a subconscious level. Nor is “independence” a sign of objectivity. Just because advisors are independent does not mean that they don’t receive commissions (or referral fees) from third parties. You have to ask. Your interests are best served by an advisor who is a fiduciary. A fiduciary must disclose how the advisor is compensated along with any related conflicts of interest. A good place to begin is with the website of NAPFA, the National Association of Personal Financial Advisors, whose members are all committed to upholding a fiduciary standard. Non-fiduciary broker-dealers and their registered representatives are held to the lower standard of suitability, which allows them to offer only “suitable” advice, even if they are aware that it isn’t the best advice for their client. Under the suitability standard, an advisor could, for example, recommend a mutual fund that returned a fee to the advisor, even if the advisor knew that a comparable, less expensive fund was available. The remainder of the article is good as well. It warns about the difference between fee-only and fee-based compensation. And it has a long section about interviewing candidates.